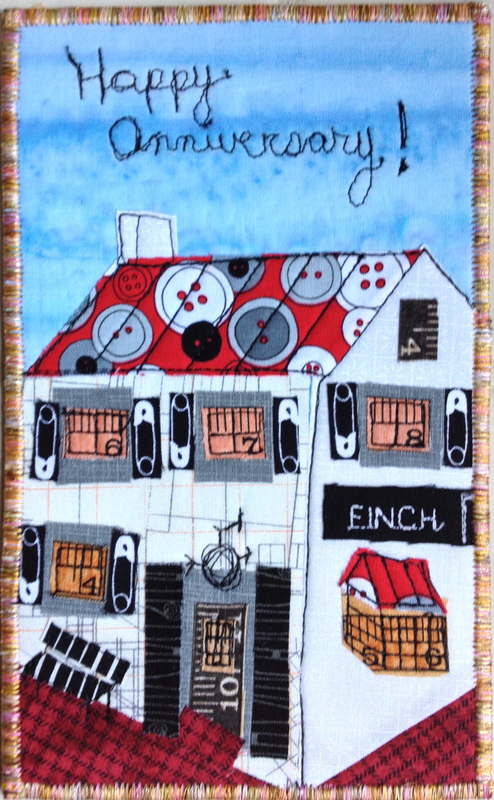 Fabric postcard – Size is 5 x 8 inches. 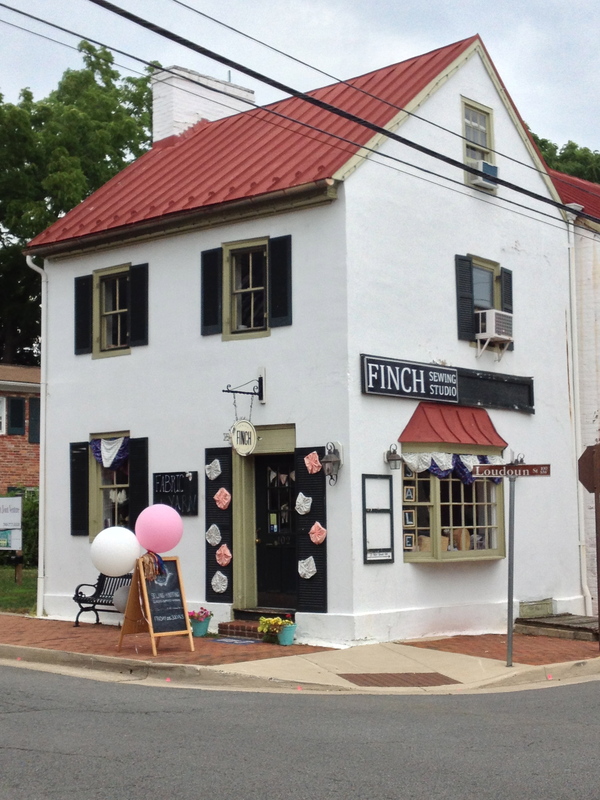 Nicole at the Finch Sewing Studio is celebrating the 1 year anniversary of her shop being housed in an old building in the historic business district of Leesburg, VA. I met Nicole through the DC Modern Quilt Guild and I have been an avid supporter of her business. It hasn’t been hard to support her. I have had so much fun taking classes with my sister, my daughter, and my friend Anne at her shop. She always has an interesting and varied selection of modern fabric. She has inspired me to try my hand at sewing clothing that actually fits me. Last night, knowing that I would see her today (to shop her Anniversary sale! ), I made a little fabric card to give her. I didn’t take any “progress” photos. Basically, I new that I wanted to replicate the front and side of her building. I wanted the front of the building, but also the Finch sign and pretty bay window on the side. I searched on the Finch Facebook page, Instagram, and Google Maps for photos of the shop. I wanted the card to fit in an envelope that is 5-1/2″ by 8-1/2″ which is a regular sized piece of paper folded in half. I sketched out the design in pencil. I realized at this point that the overall design had to be a little smaller than this to fit in the card and for me to do a satin stitch around the edges. I simply reduced this drawing to 85% on my copier and cut out the pieces for the front of house, side of house and roof to use as templates. Everything sort of fell in place after that. A piece of Pellon Peltex (really stiff interfacing) forms the core of the card. I used Wonder Under to fuse the pieces to the card. I also had to interface the white building pieces to avoid having the blue of the sky or the red of the brick walk show through. Sewing themed fabric was incorporated just for fun. 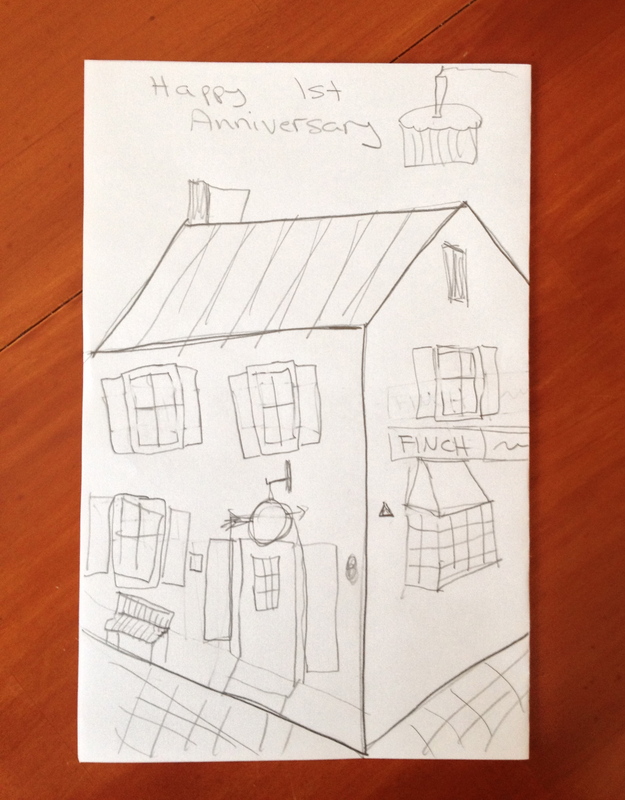 I debated about free motion stitching the “Happy Anniversary” at the top. I knew it would look messy. In the end, though, I decided to go ahead and do it. It is a hand-made card after all! 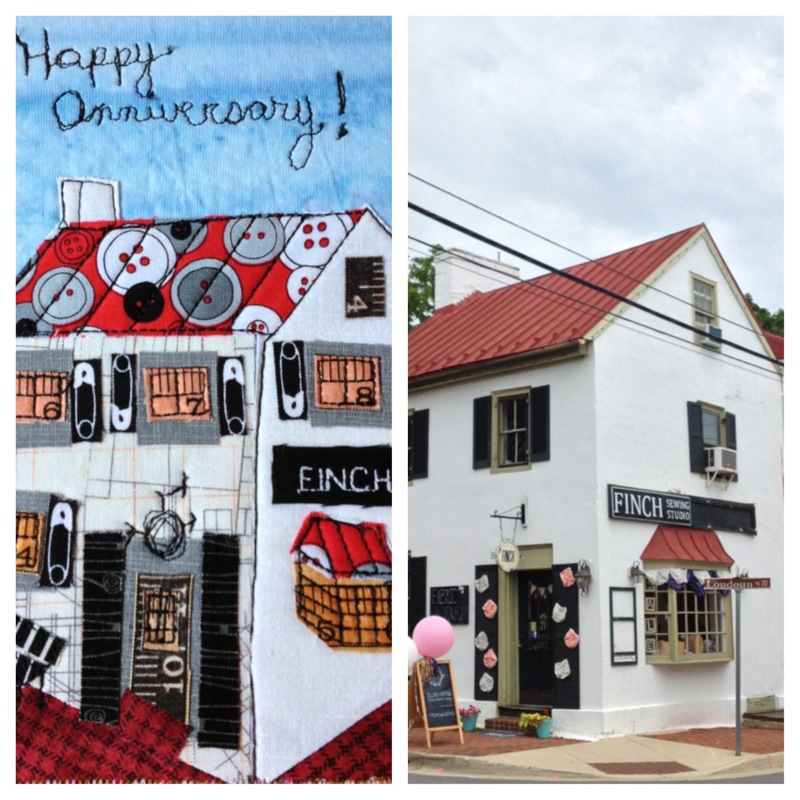 Happy Anniversary Finch Sewing Studio! This is so great Linda! Nicole must have been bowled over! At least she seemed to recognize it as her shop! I think you did a great job! You have such a good eye for “fabric painting” I call it. It is an adorable card. I love the fabric choices. What a great postcard you made! Did you mail it to her? I have made a lot of fabric postcards in my day. I like Fast-2-Fuse. It is much like Peltex, but is a double-sided fusible. Cuts out a couple of steps. I buy it buy the bolt and cut out 20 or 30 at a time. Same for the muslin or tone-on-tome backing. I keep them in a small Rubbermaid box and have them ready whenever I want to make a card. I only make them for special people these days. I found the swaps unrewarding and a lot of people would not appreciate the work. So I am selective in who I make them for, now. Thanks for telling me about your process and materials. I have used the fusible Fast-2-Fuse (or a similar product) before but I didn’t have any for this project. I agree that it does save a step. I did not mail this card, I hand delivered it. If I do mail a fabric postcard, I always put it in an envelope. I just can’t bear the thought of it getting dirty or lost. What a sweet, thoughtful thing to do. I am sure Nicole will treasure this little gift (and your support) for a long, long time! I’m delighted that we will be meeting at the Finch for a couple DCMQG meetings! I think you did a fantastic job! You captured the essence of the shop and the fabric choices are adorable. Thanks Jan. I’m thinking about making some generic cards for the Needlechasers while I have the supplies handy. I love this postcard!! I’m sure Nicole will treasure it!! What a thoughtful gift for Nicole! I love all the little details you included. So cute! Thanks for your nice comment about my postcard. I wish that I lived closer to the Finch Studio too! It’s about an hour away in good traffic for me. But I love to go there!